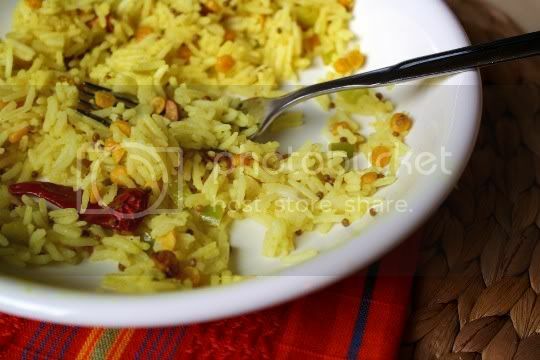 Probably some of the most intensely flavored rice you'll ever eat, this pulihora (or "sour rice") is a beautiful and tasty dish best served aside curries, stews, or other spicy dishes. It's tangy, earthy, pungent...all the good qualities of an Indian dish. 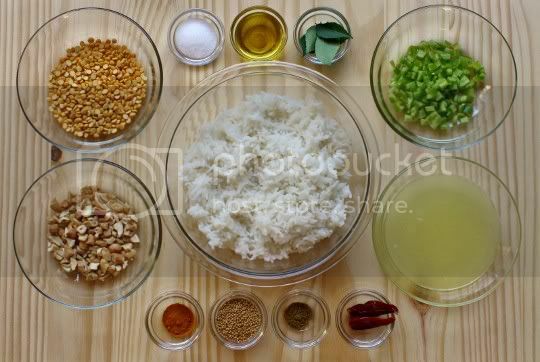 It's also pretty easy to make; most of the recipe is adding cooked ingredients to already cooked basmati rice. Cashews and soaked channa dal are sauteed, then added to the rice. A spice mixture of turmeric, mustard seeds, cumin, dried chilies and Anaheim chilies, and curry leaves (which you can find in any Indian market) is quickly cooked, and lemon juice is then added to taste. All of this is finally added to the rice, and now the hard part...it has to sit for two hours! Let those flavors really develop! A few recipe notes... CUT BACK ON THE SALT! Seriously, I have no idea why so much is called for (2 1/2 teaspoons). You can probably do about half of this. The amount as is combined with the lemon juice is just way too much. If you're watching sodium, you probably can cut it out completely...the lemon juice and spices provide more than enough flavor. And speaking of the lemon juice, the recipe calls for 1/3 to 1/2 cup. I used the full 1/2 cup, but I think 1/3 would have been enough (or somewhere in between those measurements). Finally, I think the dried chilies are just there for decoration, and the Anaheims really don't add much flavor. I'd suggest using jalapenos (and leaving the seeds intact) for some extra spice). But in the end, you'll have a tangy, yummy, and filling side dish. 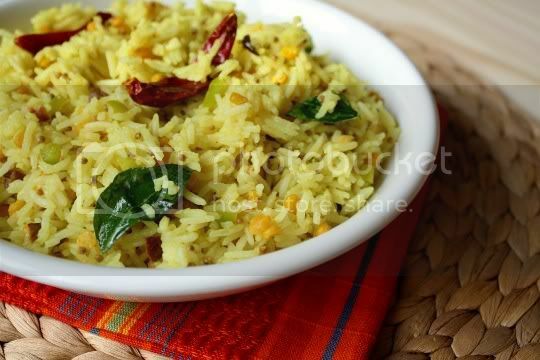 The spice mixture is really what stands out (well, aside from the super tangy lemon juice): the turmeric gives the rice that beautiful and rich yellow color plus some earthy flavor, the cumin provides smokiness, and the curry leaves even omit some herbal zest. The cashews and channa dal add a crunchy texture. The only thing possibly missing from the flavor explosion is something sweet: golden raisins or currants would be wonderful here! Make again? Yes. Although the curry leaves and channa dal might be a bit hard to find, this dish is worth it. But remember, cut back the salt! Did you perhaps use table salt instead of kosher salt? Kosher salt is "sweeter" than regular salt, so perhaps that's why you thought it was so salty? I did use regular table salt...however if you click the recipe link, you'll see it just says "salt." Nothing about kosher or sea, etc. Not sure what kind of salt the recipe developer used, but I'd sure like to know! Thanks yall! It's amazing what an SLR upgrade did LOL. @Kathy, wow I never knew this site existed...will start uploading at once! This looks and sounds delicious. I've never seen or heard of channa dal, but I'll have to keep an eye out for it. Indian food is something I don't have very often, and never cook, but wish I did both more! Hi there, thank you. Liked you're spinach dip recipe, it was very yummy! Keep up your good work.